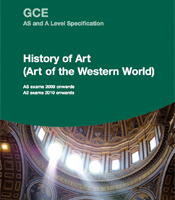 We are not developing a new A-level History of Art qualification due to government changes to A-levels. History of Art (Art of the Western World) establishes a framework for exploring aspects of western art and architecture. It enables students to achieve an appreciation of some significant themes from classical Greece to the end of the twentieth century and demonstrate the skills of investigation and interpretation within the context of History of Art. This four-unit specification requires students to develop their ability to communicate their knowledge and understanding of art historical movements, practitioners and works, considering the way that these change and evolve within chronological and other frameworks. It also builds their understanding of the relationship between society and art; art historical terms, concepts and issues; methods of researching, investigating and analysing and use of evidence and how works are interpreted and evaluated. There is no controlled assessment/coursework element to this course. This specification assumes no previous knowledge of History of Art and is suitable for students who wish to develop their interest in and enjoyment of the study of History of Art.